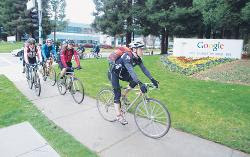 The Examiner did a story on Googlers that commute to campus by bike - all 40+ miles, several days a week. I'm on the SF2G (San Francisco to Google) email list, but I'm too afraid to ride with them any time other than Bike to Work Day, despite the fact that they are actively courting newbies. It's on my to do list though, I swear - once I get my bike computer working and can confirm that my average rolling speed is not completely embarrassing. Unfortunate that the Examiner photographer had the SF2G-ers ride on the sidewalk to get his dramatic cyclists + Google sign shot. once you get your bike computer working? you got it for xmas. it's almost march. :little irish punk: boooooo. I am having technical issues. So quiet booooo yourself.